I think I speak for many indie pattern enthusiasts when I say how saddened I was to hear that the women at By Hand London had decided to close their doors on their printed patterns and fabric printing businesses. They took a great leap of faith in launching their kickstarter campaign and whilst many of us got behind them unfortunately it wasn’t enough to make their new venture viable. However, I would like to take a few moments to remember the good times BHL gave us. Here are my top BHL moments, some personal, some global. 2. Meeting the real Charlotte, the woman behind the skirt! When I was staying in London I emailed Charlotte to purchase some patterns from my shop. She noticed my new address was mere suburbs, no longer oceans, from her apartments and she kindly invited me over for a cup of tea. We had a great yarn about the indie pattern industry, the best places to buy fabric in London and our travel dreams. She is incredibly hospitable and I was very touched that she invited me, essentially a stranger, into her home. 3. The joy of unboxing one of the beautifully designed patterns. So much of the joy is in the unwrapping! And yes, all indie designers take a lot of pride in how they present their patterns. But BHL packaging is next level beautiful. The lovely thick coloured card, the cut out front revealing one the of pattern views, the line drawings and sketches. Their printed patterns included so much detail, and all very much appreciated by your buyers. 4. Number four has to go to ‘sewing my first BHL pattern.’ It was only a few days after I had visited Charlotte at her house. I was feeling terribly homesick so I took myself to Sew Over It, bringing with me a Charlotte skirt pattern and some very bright brocade. I immediately felt at home – laying out my pattern pieces, marking my tacks, stitching the skirt together in my haphazard way. It was a lovely way to spend a day. Here is the skirt I made. 5. The bios on the back of the beautiful patterns topped off their beautiful packaging, undoubtable creating an emotional connection with their loyal customers. Surely these must be true right? I can just imagine Charlotte getting down do a sleezey RnB beat and I’m with you Elisalex – you can never be overdressed. Sorry Victoria, I did have a chuckle at your jelly phobia! 6. Three girls one pattern – totes inappropes, but well played ladies. Here’s their ‘Three Girls, One Kim Dress’ post. (If you don’t get the reference, I’m really sorry but I won’t explain it to you!) 7. My Georgia dresses. 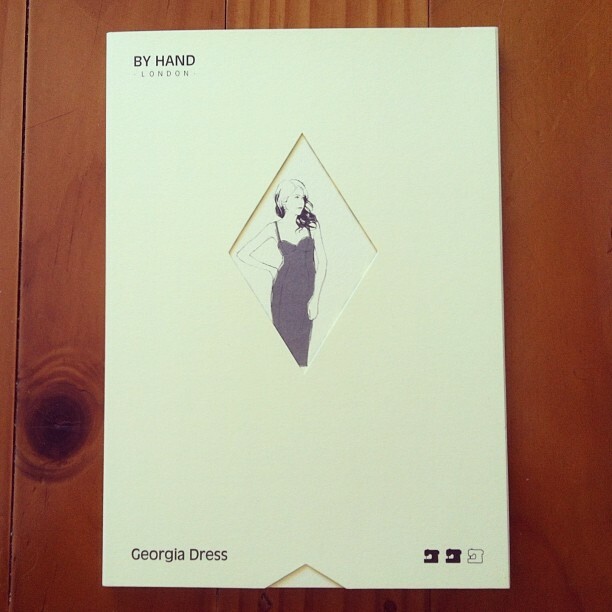 Being the curvaceous lady that I am, I had, prior to meeting Georgia, steered clear of tight-fitting patterns. I had assumed it would take a lot of fitting a fluffing about (I am a woman of efficiency) to get any fitted dress to look good. However after only one muslin I managed to pull my first Georgia together. My second is below. This pattern gave me the confidence to sew more complex patterns. Thanks Georgia! 8. The circle skirt app. Did you know that the clever BHL ladies created an app that gives you the necessary information to make a circle skirt without a pattern. You just enter your waist size, whether you’d like a full circle skirt, a half circle or a quarter circle and if you’d like to make a mini, midi or maxi length. Everyone loves a free pattern/tutorial so check it out. All BHL patterns are on sale for $20 until all sold. What is your favourite By Hand London moment? Have you ever made something and immediately thought “I’m probably never going to wear this”? This is how I feel about this dress. We all know I lost my sewing mojo a few months ago. So after my marvellous cushion covers I decided to crack on with a project that I had been thinking on for a long time. And although this idea had stuck in my mind for several months I hadn’t been able to bring myself to cut into the fabric. I should have trusted my instincts. I finished the dress in record time and rushed to try it on. My first thought was erghhh and my second was this is a very stuffy dress. I was pretty under-wowed with my creation. My biggest issue with this whole look is that I fell into the vintage-pattern-trap — an affliction that causes me to see all the potential of a vintage pattern without considering how how dated and therefore costume-like it might look in today’s context. In particular, I fell for the A line skirt and the high (almost) Nehru collar. The worst part is that I chose a psychedelic orange fabric with floral details that amplified the costume-i-ness. On the plus side I really enjoyed the process of sewing this dress. It was very quick to put together – something I put down to all the straight lines – the linen was very easy to work with and most of all. I’m back in the habit of seeing. Like all the time. At the moment I making a Davie dress. 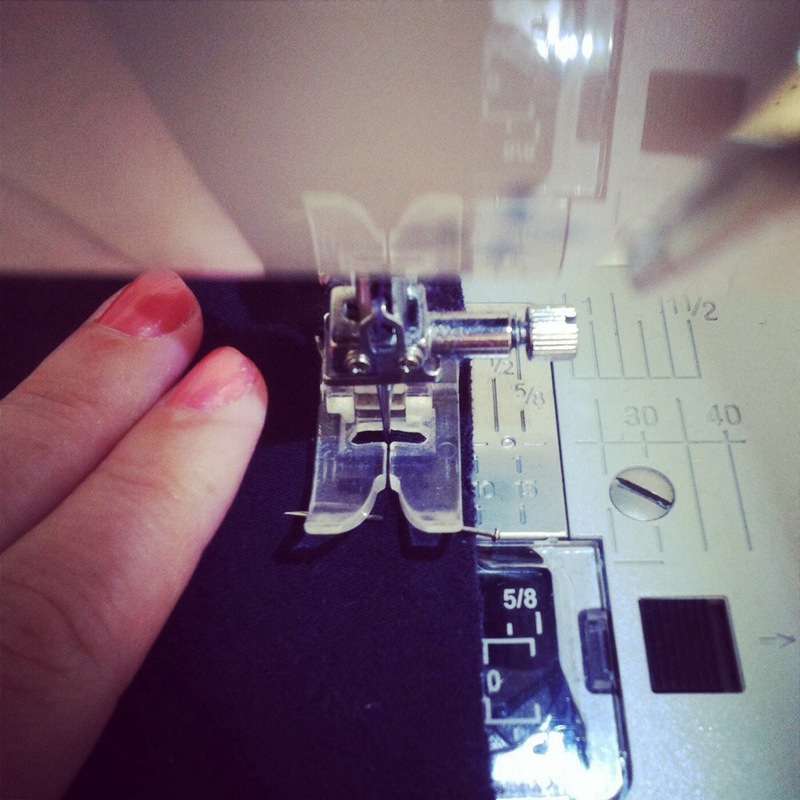 What’s your biggest sewing fail? Please share! I have to say I just love being part of the sewing community in person and digitially. I love that someone can say “let’s all do this sewalong” and sewists just get into it! It’s awsome. In case you’re not on Instagram (which is totally where it’s at) Bimble and Pimple blogger Amanda has organised an online event called Sewvember using the hashtag #bpsewvember. 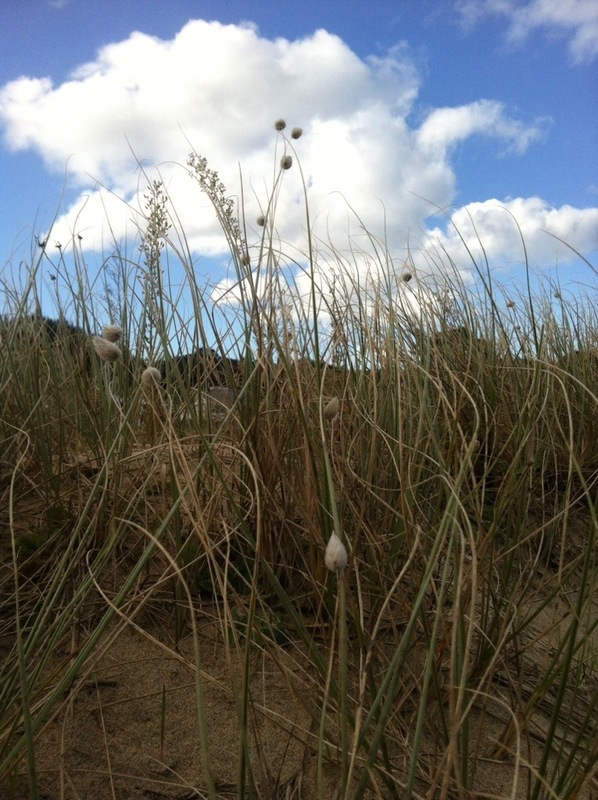 There’s a theme for each day of September and you take a photo on that theme and share it. So yesterday the theme was an Early Make – something that you sewed when you first got going as a seamstress. I shared the picture above, my wool crepe vogue dress. 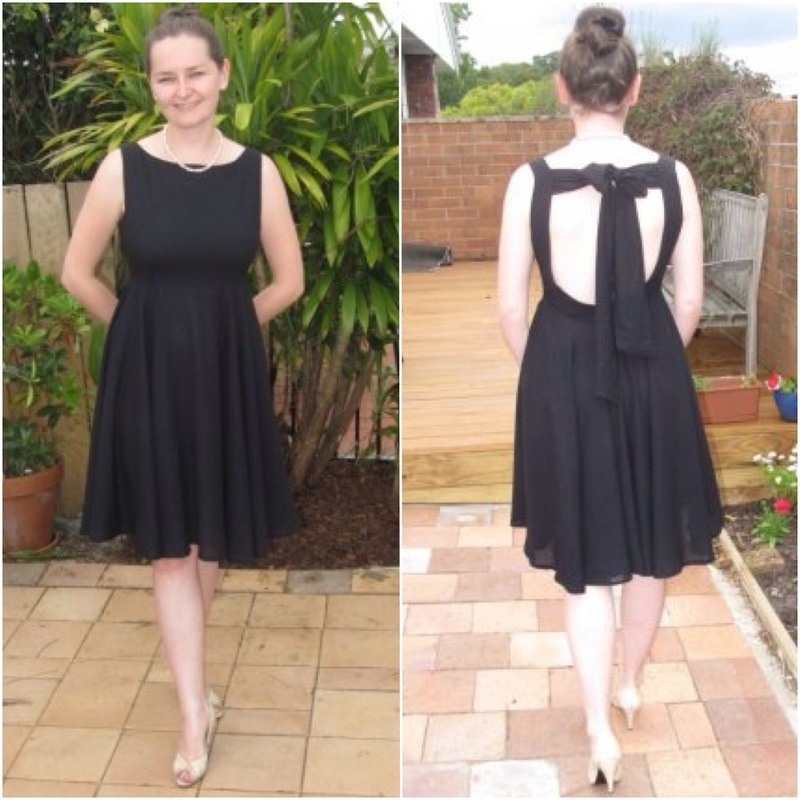 I made it in 2011 and despite having no finishing on the seams (I was very new to sewing) I have worn it heaps, including to a wedding at the beginning of this year, to a corporate ball and to my graduation. 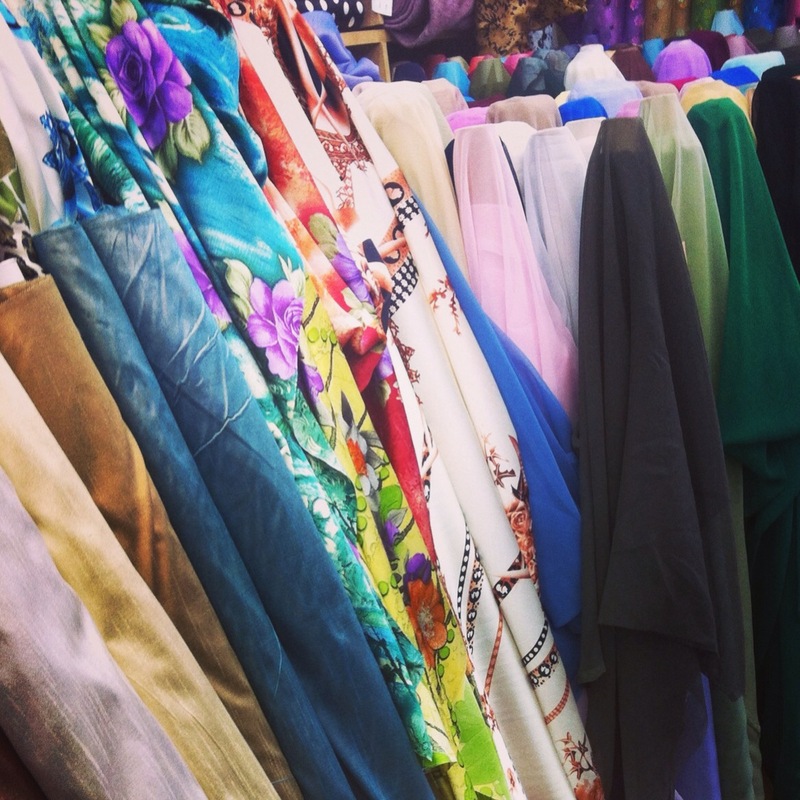 One of the most interesting themes was Insides – the lining or finishing of a garment. I posted the photo above. 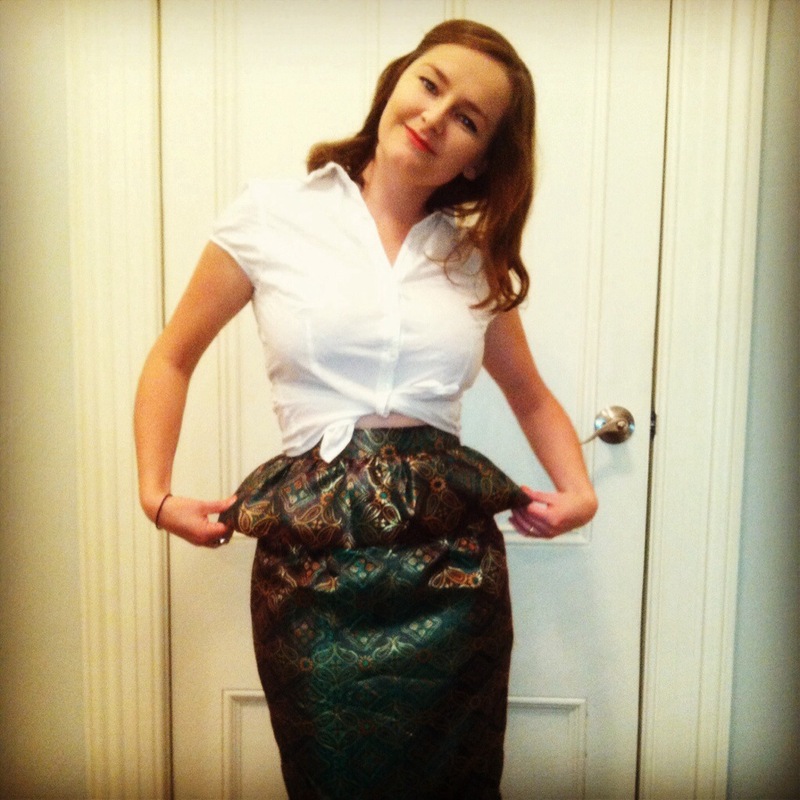 It is the lining and facings of the navy brocade dress I made for Julia Bobbin’s Mad Men Sewalong in 2013. Navy on the outside, shocking pink on the inside! Prior to that we shared photos on how we are inspired to sew. A bunch of people said Pinterest was what got them going, others said their surroundings like street fashion or the environment. For me it’s the fabric! Glorious fabric. I guess I kind of work backwards, finding fabrics that I love and working out what kind of garments they would look great as. 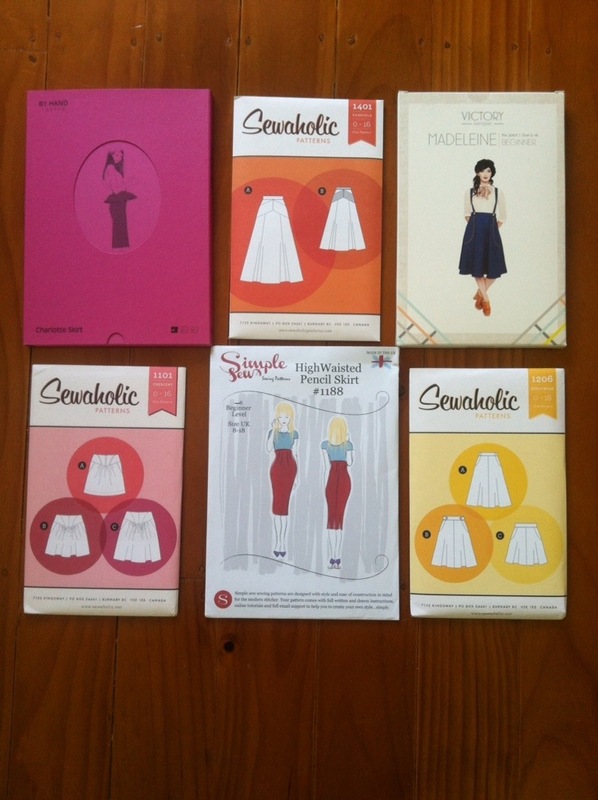 I *heart* the sewing community! Thanks for being awesome everyone! Hello lovely readers! 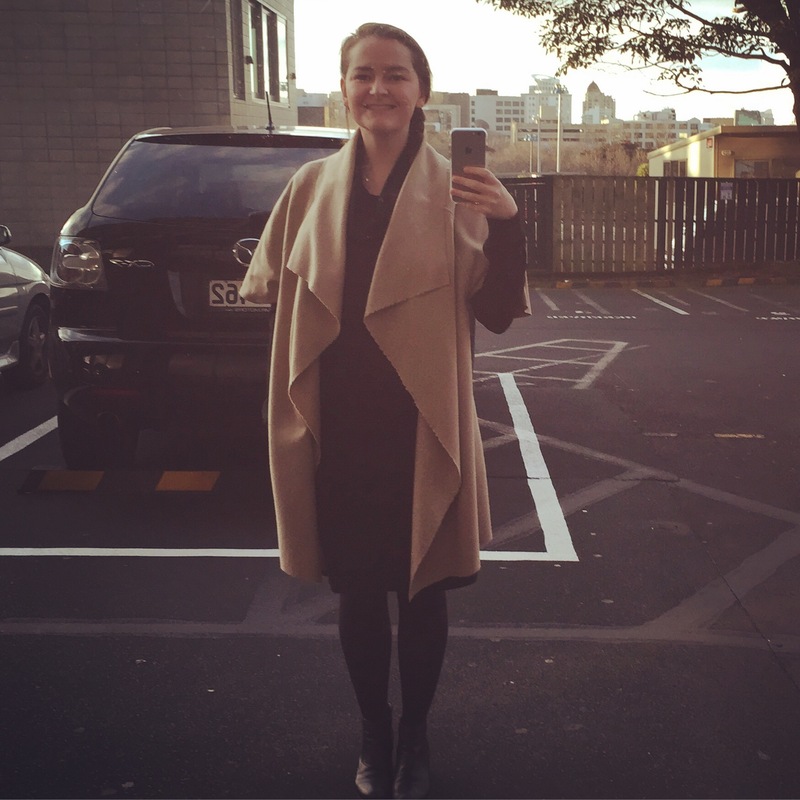 I am so happy to be back and blogging on a regular basis. October has been so jammed packed for me that I thought a round up of my Instagram would be an accurate showcase of my month. First things first, I finished my degree! I’ve just completed my postgraduate diploma in communication studies (public relations), meaning this is my first weekend off this month! Woohoo! I’m now on the job hunt and I’m keeping my ear close to the ground for exec PR roles. 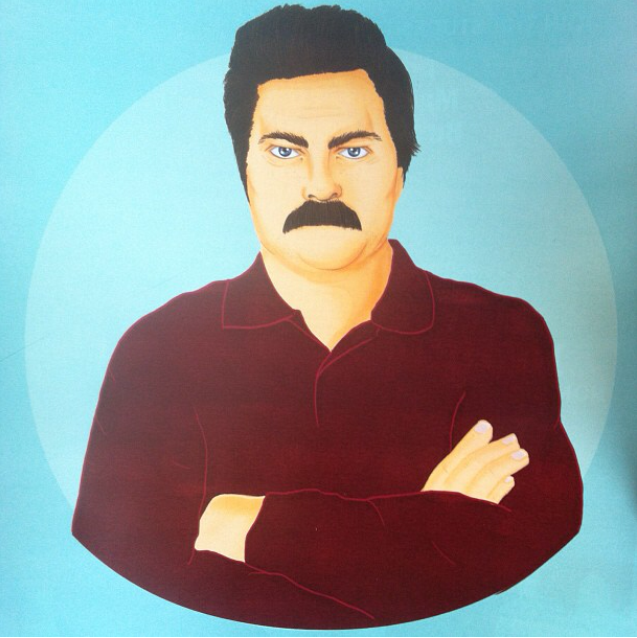 Ron Swanson’s tough looks motivated me to get though. 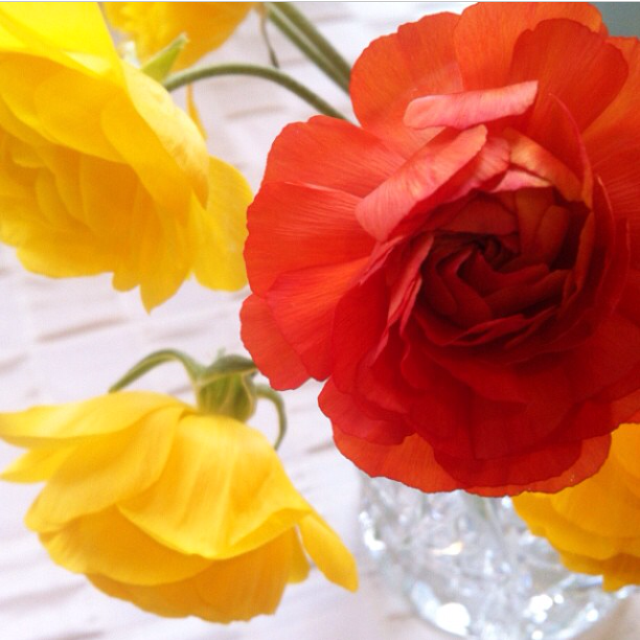 This month I was totally obsessed with my ranunculus. I took a rid-unculus amount of photos of them and unashamedly posted them all to Instagram. My obsession was so great that one night there was a storm and I was like “whoa better bring the ranunculus inside so it doesn’t get hurt”. Recently I celebrated my 25th birthday with a 25-25-25 sale – 25% off all sales for the first 25 customers for my 25th birthday. This was the first sale I’ve had of this kind and I was overwhelmed by the response! I love all you fangirls! Like I say, I don’t do these sales very often at all and it was a tad spontaneous so the best way to find out about these in the future is to follow me on Facebook or Instagram. Next sale time: Unknown. And… what else? OH YEAH! I managed to get my hands on some of this! If you’re not from NZ skip this one because it will have no bearing on you but if you ARE then ‘nuf said. Still have a hankering for some of this stuff? 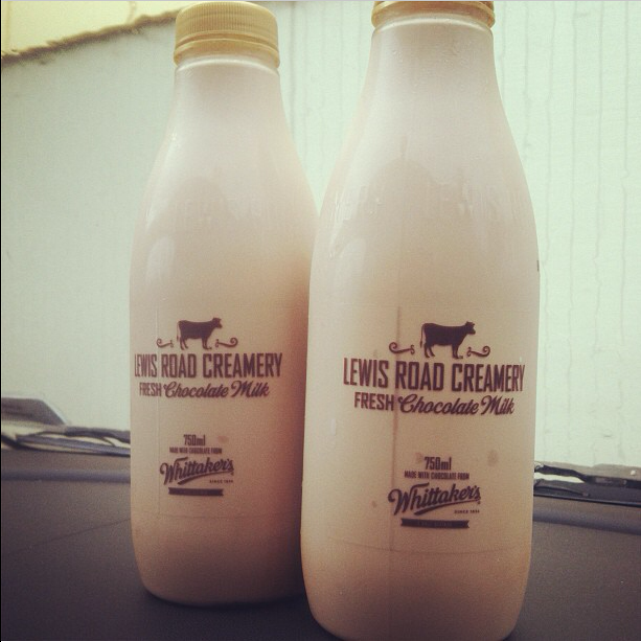 Lewis Road announces their delivery locations every morning on their Facebook page. 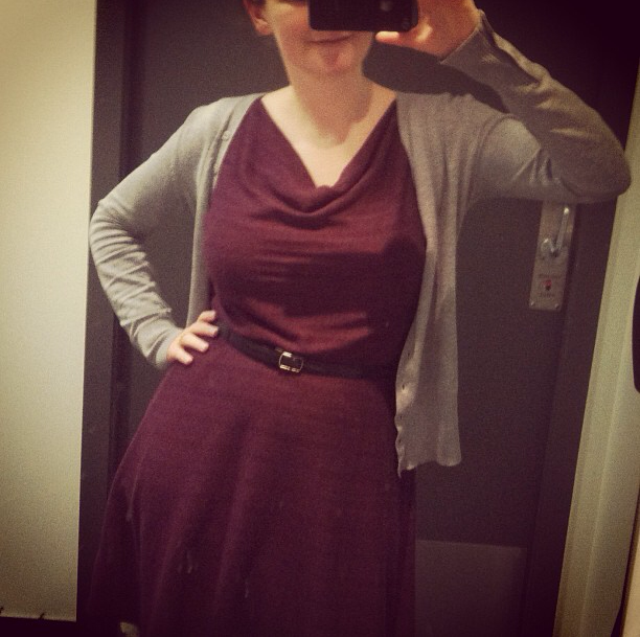 We’re heading into summer here in NZ so I squeezed in as many wears of my mauve merino Myrtle dress as I could. I also took selfies in the bathrooms! #highonahillwasalonelygoatherd – yup I went to see The Sound of Music! 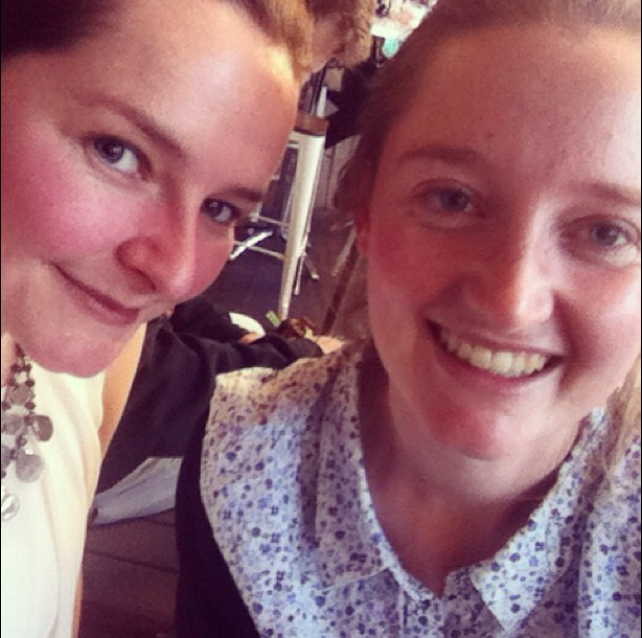 I got a selfie outside the theatre at Giapo, which, in case you were wondering makes the best ice cream ever. If you aren’t following their Instagram I would *totes* recommend it. It is beautiful. This is my sister by the way. 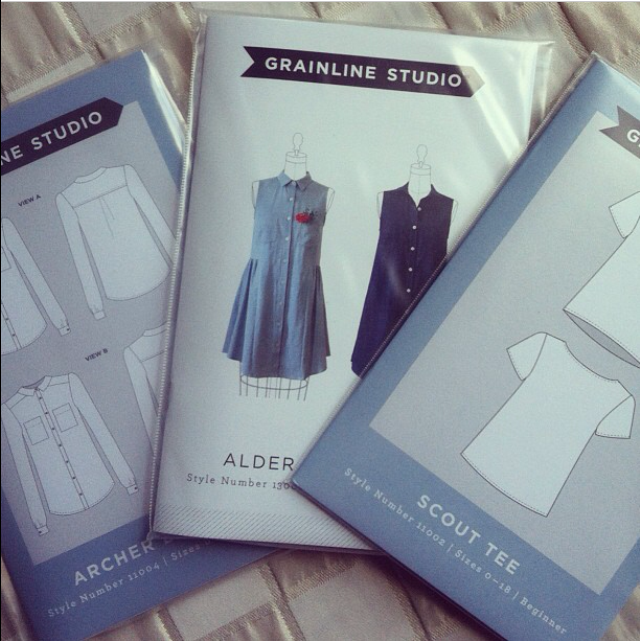 In Dresses & Me news – I am now stocking Grainline Studio’s Scout Tee, Archer Shirt and I have the Alder Shirtdress back in stock (but it’s selling out SO quick!) Grainline is blowin’ me away with their popularity! I’m always interested to know which patterns you’d like to see at Dresses & Me. So if there’s something you have a hankering for just let me know here. Lastly, I’m starting to think about my summer wardrobe. I have a gaping hole for light summer jackets (that aren’t blazers) and simple summer dresses. At the moment I’m thinking of making this combination below. I’m a tad skeptical as I bought the fabric from Martha’s Fabrics, which of course sells fabric for furnishings… Hmmmm will have to ponder on this one a bit longer before I cut into it. That’s my October in a nutshell! What were your highlights? There are few things more devastating for a sewist than trying on a half made garment and being completely unable to join the packets together. The only thing more devastating than this is realising that no you haven’t got the seam allowances wrong, and yes you did check the sizes on the back of the envelope before you cut your pieces. So yes, I am 100% sure that I are not the same size I once was. People that sew know their body measurements off the top of the heads. There is no getting around talking about bodies, because when you sew you need to talk about waist, hips, ease… And there is no room for being all like ‘this shop’s sizes run very small’. It is what it is. So when I attempted to try on my Alder Shirtdress mid-sew I was 100% floored when I discovered that I was no longer the Penny I once was. This is a shirtdress, the plackets would puckers. And before you suggest it yes, the side seams had already been overlocked. But the thing I found the most upsetting from this whole experience was the camaraderie I found in the company of women. It was like I had joined a club, you hate you body? Oh yeah, I’ve been hating mine for years now. Women I barely knew were sharing their diets, exercise regimes and miscellaneous disappointments with the way they looked. It was nice, at first, to be part of this club – but it is also disturbing. I don’t want to feel camaraderie with a group of people who hate their bodies – until very recently I’ve been perfectly fine with mine. These conversations should not be normal… But, there is always a but, it’s hard to deny that I spend that vast majority of my day sitting in front of a computer researching and writing essays. And, ok there are two buts, I am the first to admit that I blatantly use my asthma as an excuse to avoid exercise. So what’s the point in telling my readers this? Because I don’t want to part of this club and far more importantly, I want to confront this issues head on. I need to get over it and realise that there are far worse things than going up a dress size or two. And, frankly, I know only I care how I look. But I do want you to know that there will be some fitness posts on my Instagram. Does this mean that I’m giving in to the club? I don’t think so. I think I’m going to carry on as I have done before – avoiding women’s magazines, diet fads and ‘style tips’ because before I bought into this culture I was perfectly happy. And I think I’d like to return to that state of affairs. Hi readers, it’s the beginning of a new month and that means that it’s time for behind the scenes. 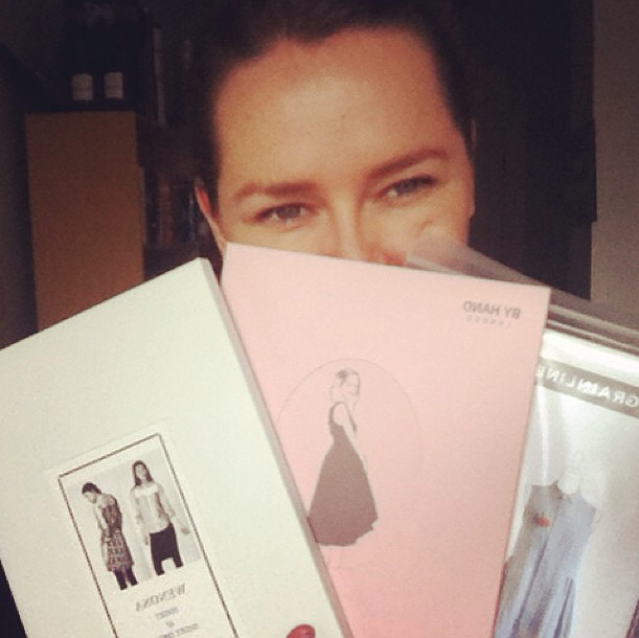 April has been another busy month for me – both with Dresses & Me and in other parts of my life. So read on if you’d like to know what’s been happening. 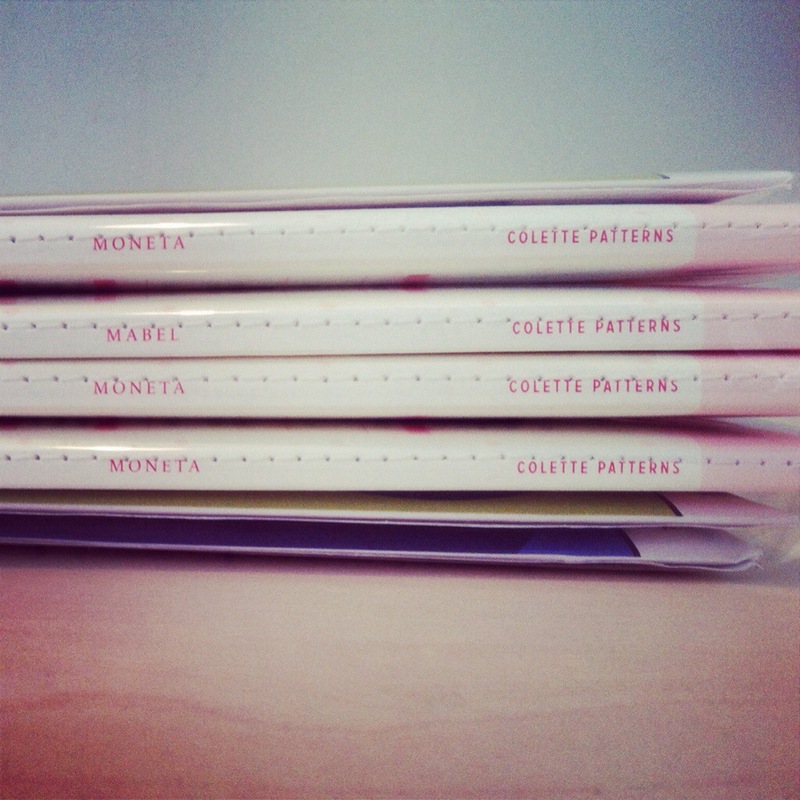 This month I achieved one of my goals for 2014: bringing Colette Patterns to New Zealand. I use the word “achievement” mostly because of the endurance required to make this happen! I began organising this last October so I’m pleased (and relieved) that it has finally happened. At the moment we’ve got the latest patterns and there’s an order of Colette’s classic designs flying across the ocean as I type. Recently I’ve had a survey up on the site too. I’ve had several requests to stock Deer & Doe patterns in the store. I WOULD LOVE TO! …Unfortunately this is not possible as they only allow wholesale orders for brick and mortar (physical) shops. I’ve emailed Eleanor twice since opening the shop but it looks like they’ll be holding on this model. In the meantime you can buy them from her online store. I want to make this next comment brief. If you have anything you’d like to talk to me about regarding the store or my blog *please* contact me. Even if – gosh – especially if it’s negative. I’d far rather know and have the chance to remedy it than loose a valuable customer and your respect. Please, please just contact me – please?! Yes, I had a complaint. If you write a blog you probably already do this and know it happens, but I wonder if non-bloggers do? I actually spend a lot of time emailing people to keep the blog interesting. In April I organised collaborations and sponsorship for Kat and Mel’s Indie Pattern Month. 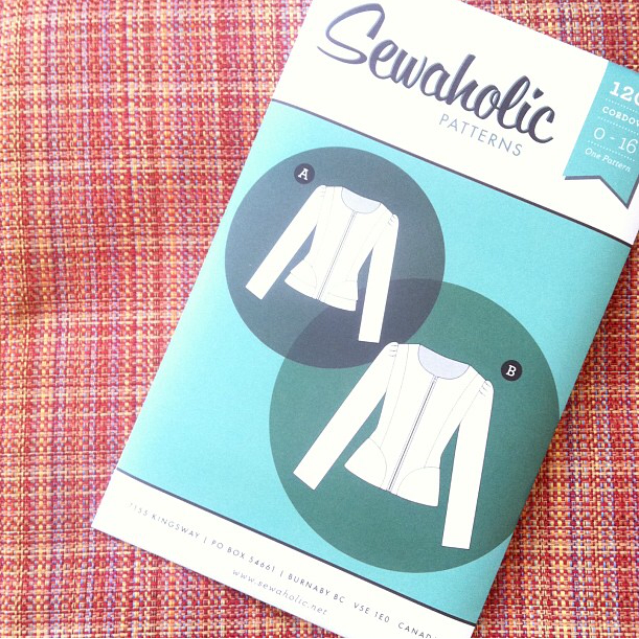 Indie Pattern Month is a celebration of independent sewing pattern producers. Mel and Kat have put a huge amount of work into organising sponsorship (read: awesome prizes), planning competitions as well as moderating the Monthly Stitch site. This is all work that they do in their own spare time, just cos they want to and I think that deserves a bit of praise! I have also been organising to host a sewalong! Whilst I can’t say too much at the moment, this will be using one of the patterns in the shop at the moment and it will be in the middle of the year. So what have I actaully sewn this month, I mean this is a sewing blog after all! Well I finished off my Charlotte skirt and, of course, my Batwing dress (yet to take photos). Is that it? 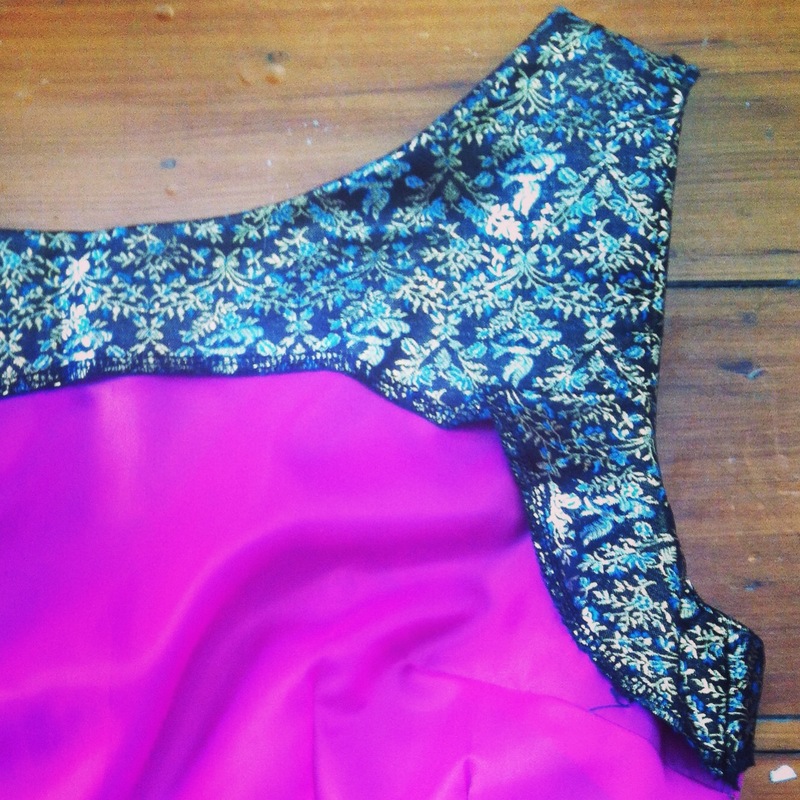 Well not entirely… I’m nearly finished making my Brigitte Dress and I started making a Jasmine by Colette. Except that in truly amateur fashion I burnt-melted a hole in it whilst ironing the darts flat. So that has completely stalled. 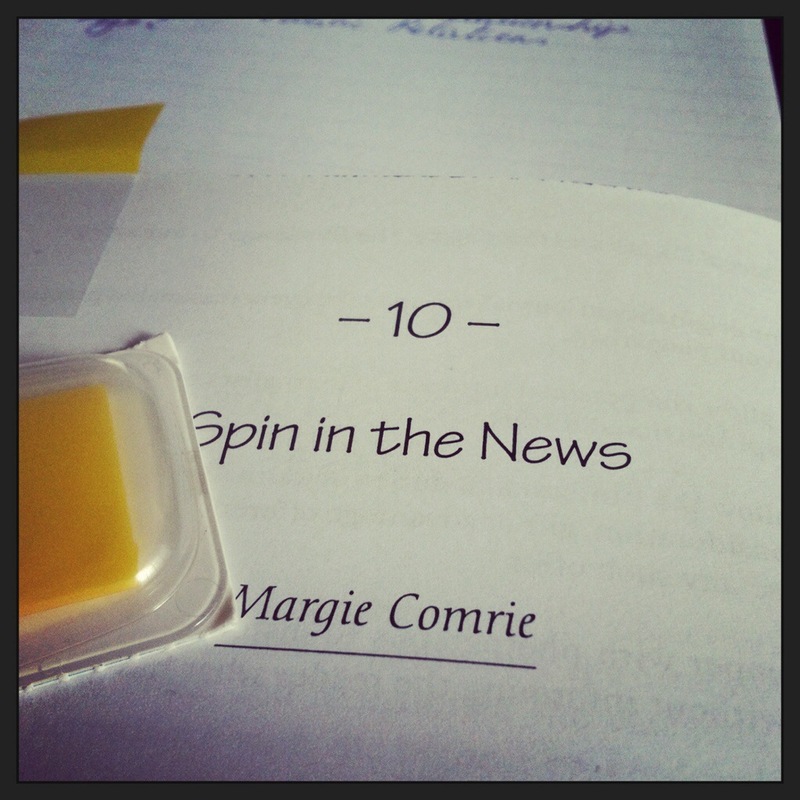 I also had a giveaway on the blog this month! Entrants took instagram photos of their cats and used the hashtag #catsforcolette. This competition was held to launch the Colette range at Dresses & Me. To see all the entrants search #catsforcolette on instagram. They’re pretty darn cute. 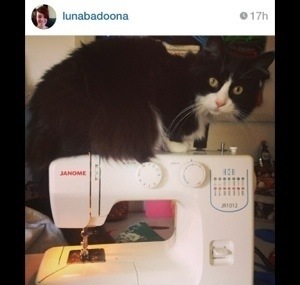 Luna won with the gorgeous photo above. I’d be completely lying if I said I flew through April. In reality it was a slog! I moved house, wrote a public relations strategy for university and began writing two more essays! I know not many people feel for the plight of the student but I’m working a lot harder this time round at uni. Perhaps I’m a bit older and wiser… or just older with a less demanding social life! Perhaps the best, and sadly, the most commersumer-tastic, thing to happen this month was the arrival of my freight boxes from London. As the last leg of my trip was backpacking we sent a lot of heavy or unnecessary things home to NZ. So when the boxes arrived I was greeted with spices and a tea set that I bought in Morocco, a 100% wool coat I bought in London, books that my family had sent me while away, fabric I bought on Goldhawk Road and a mulled wine mug from Potsdam, Germany. 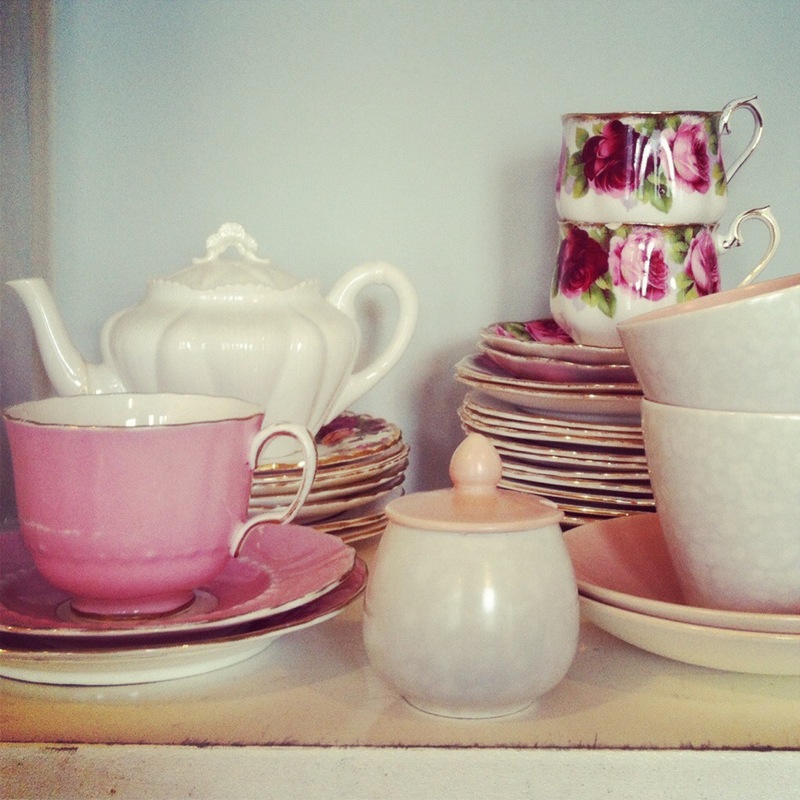 All of these ‘things’ have memories attached so it was lovely to have them in our home.